My friend Joan posted this on Facebook last night and it caught my eye this morning. So true. 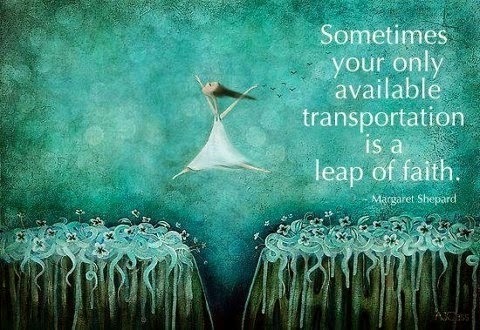 "Sometimes your only available transportation is a leap of faith." How more applicable could this be to our lives? An ongoing sense of uncertainly has become a part of our daily lives. We have no home. We have no storage. We don't own a sofa, a coffee pot, an end table or a lamp. If one day we became tired of traveling, we wouldn't know where to go. Most of our family, whom we dearly love, live in Minnesota but we don't want to live in a cold climate. Florida and Arizona are not our cup of tea-too cold in the winter. These dried fruit create an interesting display included a wide variety of dates and figs. Hawaii may prove to be too costly which we'll discover after living on four different islands for a period of seven months beginning on October 5, 2014. We shall see. We'll share the costs and details here, of course. Although we have absolutely no desire to settle down anytime in the near future, from time to time one can't help but to discuss and wonder about what may be in store when the time comes that we can't or don't want to travel anymore. It's human nature. This small display is the only one we've seen in the souks selling women's underwear. For now, it's a leap of faith. The world is at our fingertips with plans in the works for 2015, 2016 and 2017, not as far away now as it seemed over two years ago when our original planning began. Uncertainty was not a sensation that I could accept only a few short years ago. As the proverbial planner always anticipating my next event, I was one to plan my next few hours let alone not know what was transpiring well into the future. Off on a side alley, we find used items for sale, most likely purchased by the locals. If three years ago, someone told me we'd be in this spot, I'd have laughed aloud at such a preposterous thought. Now, I take in in stride, anxiety free. Tom, never the planner, accepts the uncertainty without a thought or concern. In actuality, he's been instrumental in assisting me in acquiring this level of ease with frequent reassurances that finally I've finally taken to heart. A vendor with his second hand merchandise on the ground. Uncertainty doesn't require a sense of fear, apprehension or angst. It's simply a fact of our lives that each day we've grown to embrace. It's not unlike how we no longer have anxiety about traveling from location to location. We do ponder, not worry, if our flights will be on time or if we'll like the new location. We've experienced it all, good and not so good and somehow, we made our way through it all. Our health and safety are our biggest concerns. And those we manage to the best of our ability with caution and diligence. The rest is definitely a leap of faith. More "odds and ends" second hand merchandise offered for sale. In six days, we embark on yet another leap of faith, the uncertainty of traveling, the uncertainty of a new location and the obstacles of another language barrier. And yet as we've continued on we've grown to allow ourselves the privilege of expecting a good outcome, as long as we have each other and our health and safety intact. Later today, we're walking to the Big Square to go to the ATM, a dinner out and to take more photos. With a few new itchy and painful sand fly bites (it was hot last night and my right leg ended up outside the covers), I'm still at ease, feeling ready to tackle the world. Tom, still coughing a little from his recent illness, is his old self, also ready for our next adventure. No photos were taken on this date although we did post a story, as our ship made it's way toward Egypt. More tomorrow.